08.16.2004 - Squirrels are the most common animal, nationwide, to break into houses. They will use an open hole or chew their way in, and live inside your house, which is dryer and safer than any tree. I'm currently working on removing a group of four or five squirrels from a home here in Orlando. They are mostly living in the soffit area of this home. The soffit, if you are unfamiliar with architecture, is the bottom portion of the eave (the underside of the part of the roof that hangs over the edge of the house. Most homes have soffits. Squirrels just love to live in them. The provide plenty of space. People usually hear the squirrels running back and forth through the soffits. Soffits lead right into the attic. Most of the time, the squirrels nest somewhere in the attic, but sometimes they stay down in the soffit. In this case, the soffit has a flimsy screen running along the entire length. It's meant for ventilation. It's merely stapled in, and it's a cinch for squirrels to simply push their way through it. That's what they've done in this case. They don't even have to chew their way in. I took this photograph today of one of the squirrels poking its head out just before it was about to leave to go find food and water. It'll come back several times during the day, and then sleep at night in the soffit. In order to solve this problem, I have to catch all of the squirrels, and then if the customer doesn't want another possible squirrel problem in the future, I have to install a heavy-duty steel mesh to replace that flimsy screen. I do this type of repair all the time, and it's necessary if the customer wants to critter proof a house with such an easy access point. 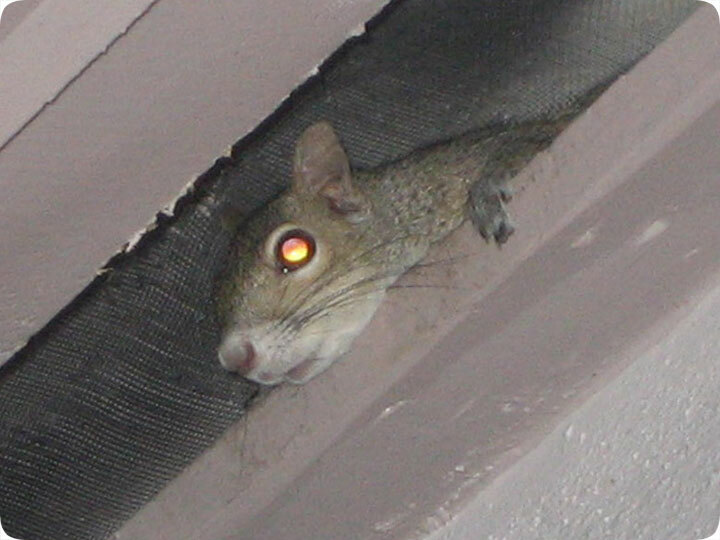 Catching A Squirrel In The Soffit or Eaves - Knowing that you have a squirrel in the soffit can make for the start of a bad day. Squirrels could damage the walls and the insulation in your home which can translate into a large bill to pay in repairs. That is why as soon as you know that you have a squirrel up there it is important that you catch it right away. The problem is that unless you have some experience with trapping wild life you could have no idea where to start. Not knowing what you are doing is also a recipe to get hurt while trying to catch the squirrel in such a small space as the eave of a house. The most effective way to catch a squirrel in the soffit is to set up a couple of squirrel traps up there. Do not use mouse traps as they are not effective with squirrels and even if they catch it, they will not kill. A squirrel that has triggered a mouse trap can end up suffering for a long time unnecessarily and that is a cruel option. You can use traps that have been designed specifically for squirrels which will trap or kill the squirrel right away. Use some peanut butter as your bait and within a few minutes you should have a squirrel trapped.